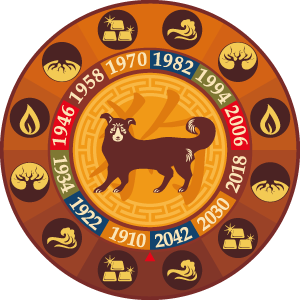 How are your chinese horoscope expectations in 2018 The Year of Yellow Dog? This year is called as The Year of Yellow Dog because, it's element is earth. Generally The Year of Yellow Dog can be a productive and rewarding time for the Chinese sign of Rat, Ox, Snake, Goat, and Rooster. It is likely to be a moderate year for the Chinese sign of Tiger, Rabbit, Dragon, Horse and Pig. However, the Chinese sign of Dog and Tiger need to be a little extra careful in most aspects this year. For those born in the Year of Rat 2018 the Yellow Dog year won't be a very good year for love. Year 2018 has many surprises for the love life, there will be many periods of change, but, overall, things will settle the way they should. Those born in the Rat year will not have a very successful financial year, at least not in the first part. They must be very careful and show responsibility and maturity when it’s about this kind of decisions. At the end of this period, your income will increase and this will happen only because of your dedication towards work. Unfortunately, the same can not be said for your health. Pay attention to your kidneys, abdominal pain, and have occasional breaks in order not to overwork. For those born in the Year of Ox 2018 Yellow Dog Year will be showtime. Although Ox is devoted and faithful and needs someone who can respond in the same manner it will be quite difficult for the Ox to find a partner in the year of the Dog. This year, those born under the Ox sign will know only success and this will be the result of their hard work. Don’t allow yourself to be pulled back by no one and nothing, follow your plan without deviations. Your proven perseverance will help you gain all the praises you deserve, but also substantial money rewards. Make sure that there are no problems with your digestive system, especially with the stomach. More exercise will do you good this year. You may offend people because of carelessness. Try not to do this because although it may seem the first victory is on your side, situation will be reversed thereafter. As the dog is a very loyal animal the people who was born in the Year of Tiger will need to be much loyal than dogs in the year of 2018. Regardless of the Tiger’s relationship status – whether he is single or involved in a relationship, his love life will be quite good in 2018, the stars are on his side. Those who was born in the year of the Tiger must be more careful when it comes to their spending habits and think twice before buying something. They are hardworking and ambitious and they will fight to gain as much as possible. You will encounter problems and competition in your career. The concern of not losing everything in a short time should always be in the back of their head, because otherwise they risk to work for nothing. You should pay attention to accidents, the liver and respiratory problems. 2018 Yellow Mountain Dog year promises popularity and charm for those born in the Year of Rabbit. The Rabbit is not going to experience the desired success in his love life. Rabbit will have big chances of starting a new relationship, but it won’t last too long. The natives born in the year of the Rabbit will work hard in this period, because their biggest desire is to have everything they want and to be able to afford anything. They must refrain from wasting money, or they will risk losing everything, especially towards the end of the year. Pay attention to your face or your head as accidents may left a scar. Nervous system, liver, arms and legs are also known to be problematic in this year. For those born in the Year of Dragon 2018 will be a year marked by welfare, happiness and approval. If he is involved in a relationship, the Dragon has big chances of living a true love story this year. Both him and his beloved one will be in perfect harmony and they will have all the chances of growing their relationship further.The Dragon will fight for social position, rather than for money, but this is something that actually implies both aspects. Their self-confidence will trigger their success, especially since the Dragon will attract on her side unique opportunities. It would be good to know where to stop because the desire to have more can lead to losing everything they obtained until that point. However in terms of health you should pay attention to your diet, you should use less or none alcohol or drugs, because it may lead to cardiovascular problems. Best of all is to guarantee your health with regular training. People born in the Year of Snake should not miss the good chance situation in 2018. The Snake is afraid not to have his feelings hurt, so he will act with caution during the new year. His interest to start a new relationship is zero and this is why it’s going to be very hard to impress him. The people born in the Snake year manage to, finally, obtain the first results of their past year work. These results will be both material and moral. The Snake natives must learn to adapt to any situation and to be always ready for changes, because these situations are very possible. You must settle resentment by yourself, and mustn't hurt your muscles by doing more exercise. Pay attention to arthritis, shoulder, arm and leg pain. For those born in the Year of Horse 2018 Yellow Dog year after a number of challenges will be a year of progress. The Horse needs to act with caution in the new year, otherwise he will risk losing the current relationship or will face difficulties when trying to get involved in a new relationship. The people born in the Horse year will be positively influenced by the stars in this period. This is a good year for investments, because the results won’t fail to show. They must be careful to keep their budget under control and to not spend exceedingly. The shopping list, with no deviations from it, is the best solution. Don't try to overload your body physically. There will be risk of accidents resulting with breaks and injuries. It is also a good idea to take quality air. It is recommended that you do not miss opportunities this year. Those who was born in the Year of Goat (sheep) will be in the scene in the Mountain Dog year of 2018, leaving to one side their laziness. In love matters, the Goat’s attitude is not quite right. The stress from the workplace might be responsible for the lack of proper mood in paying attention to other details from their lives. The Goat will have many chances to fill their pockets, they only have to make sure they won’t miss these opportunities. This is a year when they will decide to save money, not to spend them. Their plans are on the first place and they are magnificent. Health issues can not be ignored. You should eat plenty of vegetables and watch your entire digestive system. For those born in the Year of Monkey the Yellow Mountain Dog 2018 will be rewarding if and only if they became honest, fair and generous. During this year, there are big chances for the Monkey to have a successful relationship. For married Monkeys, the love for their partners is as strong as in the beginning. Male Monkeys should be more careful not to be led into the temptations offered by their surroundings. The ones born in the year of the Monkey will have plenty of money, but they will need to learn how to manage them efficiently. Some sudden shopping is possible, but this doesn’t mean you will make a dent in your budget. If you continue to work with pleasure and efficiently, your income will regenerate. There won't be serious concerns about health, but pay attention to the injuries of arms, legs, and avoid dangerous adventure. People born in the Year of Rooster will have worries behind happiness in the year of Yellow Dog 2018. This zodiac sign will have a year full of passion. Many Roosters will fall in love and will live true love stories. Although they have all the chances to find happiness, the Rooster people should act with caution. The people born in the year of Rooster must learn to adapt to any situation and don’t be scared that their financial situation will have to suffer. Variety is a very important aspect and this year will bring plenty of opportunities. You must be careful what you say to be safe and comfortable in your life. For those born under the same sign 2018 Yellow Mountain Dog Year is generally well. From a sentimental perspective, this zodiac sign will go through many changes. The married Dogs should be more careful, otherwise they will risk the dissolution of their marriage. They can fall in love easily, but their feelings can disappear as fast.The Dog people will have a very good year financially speaking. They will evolve professionally and as a result, they will have more money in their pockets. In just few words, they will be able to afford almost everything they want and they will show wisdom when it comes to impulsive spending. You should spend some time outside in the year 2018 of Yellow Dog, but beware the risk of having an accident, you should always be careful when doing sports. For those born in the Year of Pig good chance will be with you in the year of 2018 Mountain Dog. The Pig should have no worries when it comes to love matters. Although some changes might occur at the beginning of the year, this zodiac sign has really big chances of finding happiness. If the Pig is involved in a relationship, the chances for this year to end with a marriage are very high. The people born in the year of the Pig will make many compromises in order to be professionally successful. There will be many obstacles in their way, but if they don’t give up, they will succeed. Due to their perseverance, the bank accounts will be full of money, but their responsibilities will be as big as their rewards. You'll do well and you'll have plenty of energy to move. In terms of health, pay attention to diabetes, bladder pain and migraine.